Do you have a sales training plan for your sales team, or do you just give them some books to read and maybe set them up with a webinar or two? A training plan is an essential tool to confirm both that the sales team is learning what they need to know and that they aren't wasting valuable time on things they don't need. In most cases, your salespeople will start the job with a grasp of the basic sales skills. 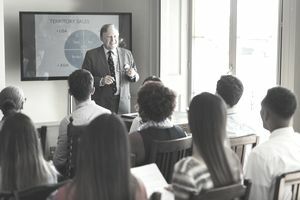 Your sales training program will build on those basic skills and also include company-specific training such as product knowledge, sales processes, and prospect qualification. Ideally, the sales training program is customizable for individual salespeople because they'll have different strengths and weaknesses. Sending everyone to a cold calling boot camp is great for salespeople who struggle with cold calling, but will have little effect on those who already possess strong cold calling skills. And first-time salespeople will probably need extra training on basic sales skills that the rest of the team has already mastered. Before you can develop a sales training plan, you'll need to determine what skills are most important for your sales team. This list will vary from industry to industry and from company to company – sometimes even from team to team. For example, inside sales teams will have little use for cold calling skills, while outside sales teams will find them crucial. The sales teams themselves will be able to provide suggestions as to which skills are most useful for them. Don't forget to include company-specific skills, such as handling CRM programs. Once your list is complete, sort it roughly by priority. The top few items will be the ones that are most important for training purposes. Your training budget will determine how far down the list you can and should go, but the first items should certainly be addressed. If you have sales teams with different responsibilities, such as inside and outside teams, you'll need different priorities for each. The next step is to compare this list to each salesperson's skill set. All salespeople have strengths and weaknesses in different areas. Some weaknesses will be low-priority, such as an inside salesperson with poor cold calling skills; but when a weakness occurs in a critical skill, training should be a priority. You can uncover these strengths and weaknesses by analyzing your salespeople's metrics. Hopefully, you are already having your sales team track their metrics and provide that data to you. If not, you should institute a tracking system immediately. Tracking a salesperson's metrics will determine exactly where in the sales process his sales are falling apart, which will help to identify the specific sales skill that he's lacking. For example, if he's getting plenty of appointments, but his closing ratio is dismal, the problem is related to his closing skills – and that is where he needs more training. If the whole team has a problem in one particular area, it can be worthwhile to send them all to group training. In other situations, individual training is probably the best option. However, customizing a training plan for each salesperson may be outside of the training budget. In that case, you may be advised to pick the most important sales skills from your list and train everyone in those skills using a group training program. It will be more time-consuming for your team but will usually be far less expensive. Another option is to assign a salesperson who is strong in one area to act as a mentor for a salesperson who lacks that skill. It won't cost you training money but will cost you in selling time for the mentor. What Are the Major Benefits of Using CRM programs?